Anesthetics are substances administered to deaden pain or produce a state of anesthesia (a condition in which some or all of the senses, especially touch, stop functioning or are reduced). Early Chinese practitioners used acupuncture (the insertion of thin, solid needles into specific locations on the body) and the smoke of Indian hemp (a tough fiber obtained from the stems of a tall plant) to dull a person's awareness of pain. Ancient Hindu (East Indian) civilizations used henbane (a plant) and wine as well as hemp. In the first century the Greek physician Dioscorides ( A.D. 40-90) described the use of wine made from mandragora (a plant known as mandrake) to produce a deep sleep in patients undergoing surgery. Dioscorides used the Greek word "anesthesia" to describe this sleep. And the Greek poet Homer (author of the Illiad and the Odyssey) referred to the pain-killing effects of the potion nepenthe. Alcoholic beverages such as wine and brandy have long been used to induce numbness. Opium, which comes from the poppy plant, also has a long history of use in human cultures. Seeds of the opium poppy have been found in prehistoric Swiss lake dwellings and in Egyptian ruins. Opium was praised by the Persian philosopher and physician Avicenna in the eleventh century as the most powerful of stupor-producing substances. English physician Thomas Sydenham (1624-1689; sometimes referred to as the "English Hippocrates") promoted opium for many medical uses in the 1600s. Early Arab writings mention anesthesia induced by inhalation. This idea was the basis of the "soporific sponge" ("sleep sponge") introduced by the Salerno (Italy) school of medicine in the late twelfth century and by Ugo Borgognoni (Hugh of Lucca) in Italy in the thirteenth century. The sponge was promoted and described by Hugh's son, surgeon Theodoric Borgognoni (1205-1298). This type of anesthetic involved a sponge soaked in a dissolved solution of opium, mandragora, hemlock juice, and other substances. The sponge was then dried and stored. Just before surgery it would be moistened and held over the patient's nose. The fumes rendered the patient unconscious. Mechanical methods of inducing anesthetic effects were also explored. Frenchman Guy de Chauliac (1300-1368) employed compression of the nerve trunk in the 1300s, as did another French physician, Ambroise Paré, in the 1500s. The ancient Roman practice of bleeding patients into unconsciousness was recommended in 1777 by Alexander Munro II of Edinburgh, Scotland, and put into practice around 1800 by Philip Syng Physick (1768-1837) of Philadelphia, Pennsylvania. The modern era of anesthesia began in the late eighteenth century when chemists began to investigate the use of various gases. Joseph Priestley (1733-1804) discovered nitrous oxide in 1772, and in 1800 Humphry Davy (1778-1829) discovered that the gas had anesthetic properties when it was inhaled. In 1818 Davy's student Michael Faraday (1791-1867) determined that inhalation of ether had the same effect. Henry Hill Hickman (1800-1830) experimented with both carbon dioxide and nitrous oxide on animals to carry out painless surgery in the early 1820s. The anesthetic properties of ether and nitrous oxide were quickly adopted by several American dentists and doctors. Georgia physician Crawford Long (1815-1878) performed the first operation under ether anesthesia in 1842. Two years later, a Hartford, Connecticut, dentist named Horace Wells (1815-1848) used inhaled nitrous oxide to extract a tooth painlessly. Boston dentist William T. G. Morton (1819-1868) arranged the first public demonstration of ether-anesthetized surgery in 1846. The technique was documented in London, England, just two months after Morton's surgery when Dr. Robert Liston (1794-1847) performed an amputation using ether anesthetic. The technique was soon practiced worldwide. A patient in anesthetized before surgery. Today's anesthetist is a highly trained specialist who administers several anesthetics at the same time. chloroform to the queen, became the foremost authority on anesthesia and is recognized today as the world's first professional anesthetist. Local anesthesia (deadening only the part of the body being treated) also became important, especially after the invention of the hypodermic syringe by Charles Gabriel Pravaz (1791-1853) in 1853. Not long after that, Alexander Wood (1817-1884) of Edinburgh, Scotland, used the syringe to inject pain-relieving morphine. Dr. B. W. Richardson (1828-1896) of Glasgow, Scotland, introduced ether spray for freezing tissue in 1866. Carl Koller (1857-1944) demonstrated the use of cocaine as a local anesthetic in 1884. Surgeon William Halsted of Baltimore, Maryland, developed the technique of anesthesia conduction by blocking nerve impulses with injections of cocaine. Because of the addictive nature of cocaine, synthetics such as Novocain were substituted. Intratracheal anesthesia, which involves introducing anesthetic through a tube in the trachea (windpipe in the throat), was pioneered by New York City surgeon George Fell (1850-1918) and perfected in 1909 by Samuel Meltzer and John Auer of the Rockefeller Institute. Spinal anesthesia (used to numb the lower half of the body) was experimented with in 1885 by New York City neurologist Leonard Coming (1855-1923), who injected a cocaine solution into his patient's spine. German doctor August Bier (1861-1949) refined the technique in 1898, and Rudolph Matas (1860-1957) of New Orleans, Louisiana, introduced the procedure to the United States in 1899. 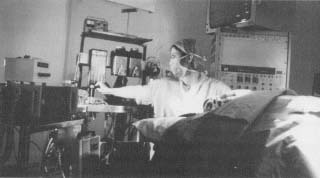 By the 1920s the use of spinal anesthesia was standard across the United States. Intravenous anesthesia (the injection of anesthetic directly into a patient's bloodstream) was first attempted by Englishmen Robert Boyle (1627-1691; chemist and physicist) and Sir Christopher Wren (1632-1723; famous architect) around 1659. The duo's injection of a warm solution of opium and sherry stupified their subject, a dog. Johann Major of Germany tried the same technique on a human subject in 1667. The idea was abandoned, however, until about 1874, when Pierre Ore used chloral hydrate intravenously on a dog and, in 1875, a human patient. After barbiturates were discovered in the early 1900s—especially after improved substances were developed in the 1920s—the use of intravenous anesthetics was firmly established. Early in the 1900s American surgeons Harvey Cushing (1869-1939) and George Crile (1864-1943) contributed to the safe use of anesthesia by monitoring the patient's blood pressure during surgery. Crile and Cushing also combined local (or regional) anesthetics with general anesthetics or with local infiltration anesthesia. Today's anesthetist is a highly trained specialist who administers several anesthetics at the same time and uses sophisticated equipment to monitor a patient's blood pressure, rate of respiration, heartbeat, and blood levels of oxygen, carbon dioxide, and anesthetic vapors. I hadn't realized that anesthetics (short of a crack over the head) were available so early. (N.B. Sadly, the computer screening of responses from this site does not permit free expression). hey this really helped me alot, but can you also include any alternatives to using anaesthesia? please and thank you very much! Can you insert something about chloroform and its affects on pregnancy? this really helped me on my report.im so glad i chose this instead of air conditioning haha.thanks alot!!! Oh my gosh this article was perfect i am doing a project on early medicine and this was the best site!